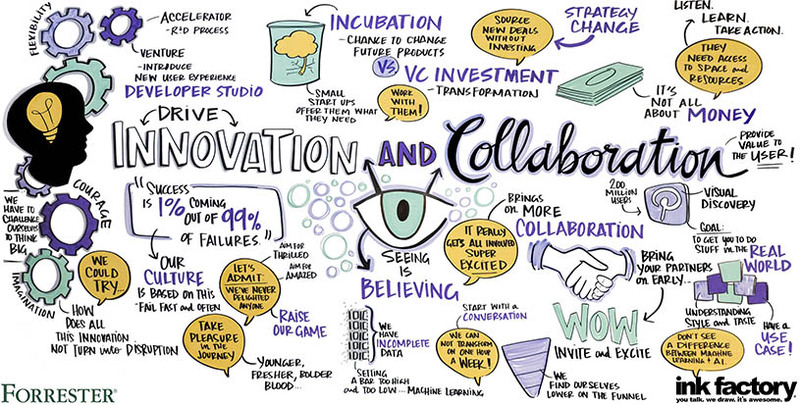 Ink Factory often has the privilege of creating visual notes for the world’s most forward-thinking, efficient and admired companies. Since listening is key to capturing content for our clients, we’ve picked up tons of wisdom that can help small businesses (like us!) plan for the future and improve their present operations. For Small Business Week, here are our top takeaways for running a successful small business or organization. User experience design, or “UX,” is taking over the corporate landscape. Companies are realizing that designing a seamless, user-friendly experience for their clients and employees is the key to providing the best products and services they can, and to getting ahead of their competition. 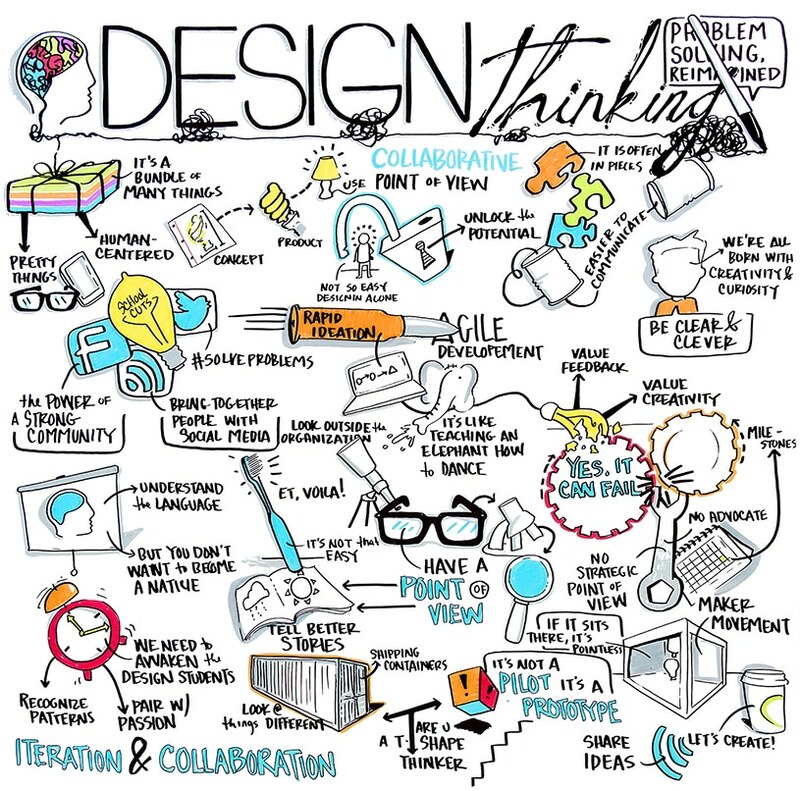 Designers implement a process of prototyping called iterative design – testing, analyzing, and refining a product or process. That means design-thinkers are constantly improving and learning from their mistakes – and they aren’t afraid to fail! While small businesses in American employ 58 million people, 70% of them struggle to find and retain skilled talent. At Ink Factory, we take hiring slowly so we can find the perfect person for the job.Over the last 6 years, we’ve more than doubled our team, and each member brings something different to the table. We’ve even implemented strength tests, like Strengthfinders, to see what personality traits we’re missing, so we can find people who will fill our gaps. 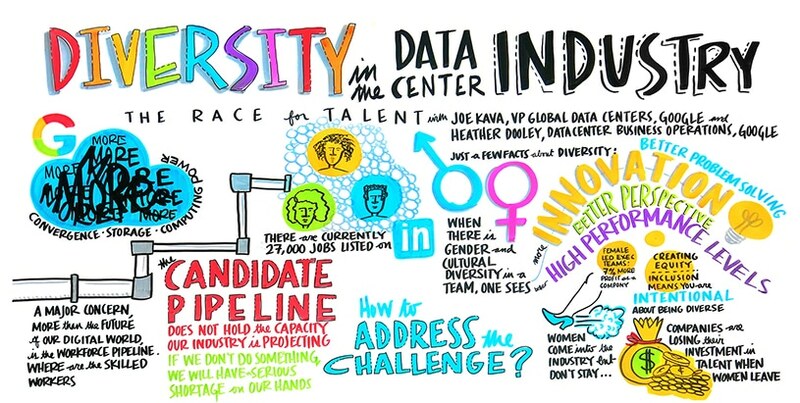 When there is gender and cultural diversity in a team, one sees more innovation, better problem solving, better perspective and higher performance levels. Be intentional about having diverse talent and be aware of your own biases when looking to hire. Like Uber or Amazon, everyone wants to be the next disruptor in their respective industry. Disrupting an entire industry means ground-breaking innovation, and to do that, top companies know cross-discipline collaboration is essential. There’s a reason why so many big organizations want to “think like a start-up!” Start-ups by nature have less people, so it’s easier to exchange ideas, collaborate, and innovate. 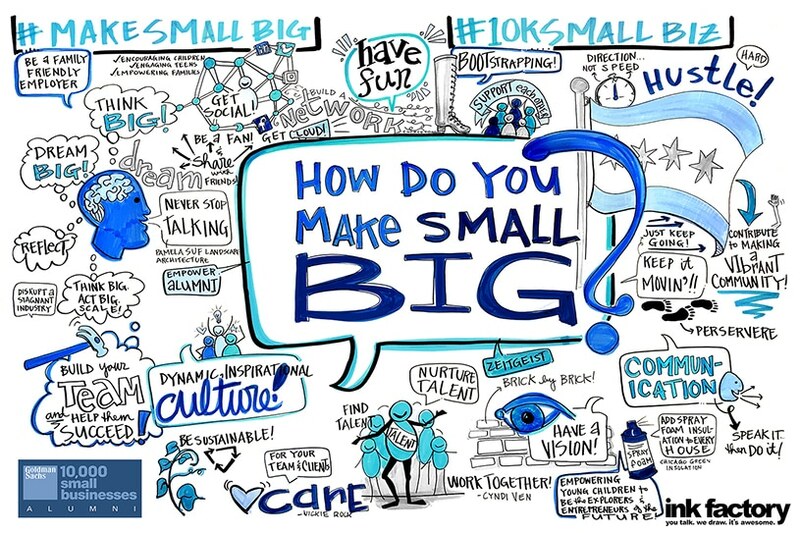 As small businesses grow, they should be careful to prevent ‘siloing’ of their organization – everyone needs to talk to each other to get the full picture of how to best innovate in their industry. Companies around the world are feeling changes in the workforce brought about by millennials. Millennials don’t want to choose between a paycheck and having a meaningful life; companies with a purpose that goes beyond profits attract better and more passionate talent (and that’s true for everyone, not just millennials). Jobs that serve a higher purpose, allow people to grow and learn, and maintain a healthy work/life balance will attract the best talent to your organization. It doesn’t get more basic than communication when running a business. If you can’t explain a product, your ideas, or a process to employees or customers, your business will struggle. And companies like Amazon are learning that communicating through traditional means just aren’t cutting it anymore. Jeff Bezos has banned PowerPoint presentations in executive meetings, and instead, everyone reads a “narratively structured” memo before the meeting begins. That’s because our brains are hardwired for narrative, and stories are far more persuasive than bullet points. 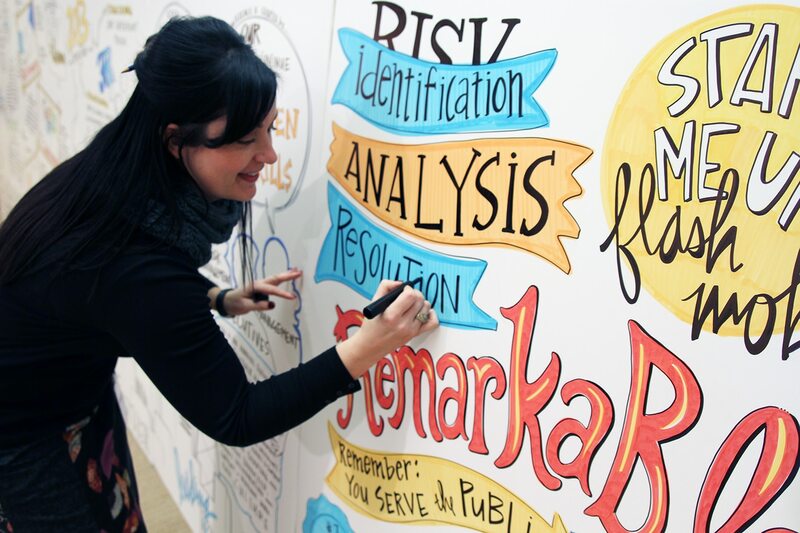 Our clients understand this – that’s why they hire us to tell their stories with visual note-taking. 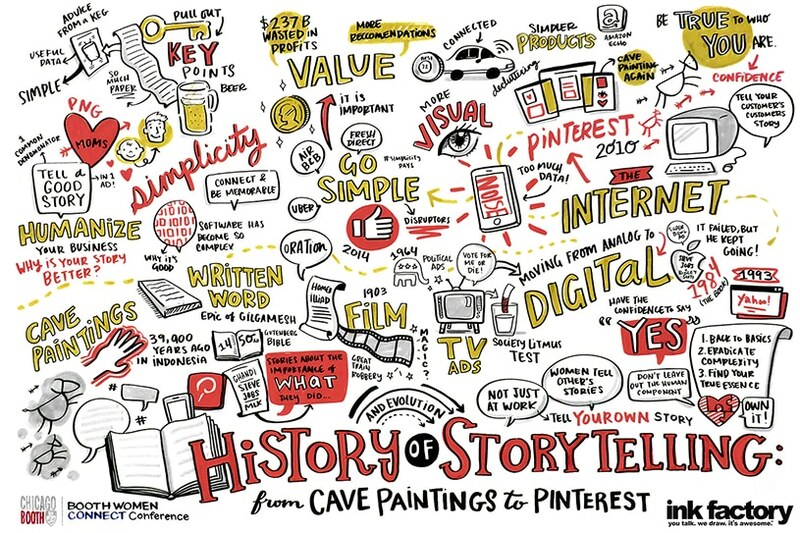 Visual notes communicate content in an intuitive way that people can quickly understand – and like narratives, are far more engaging than a PowerPoint presentation. 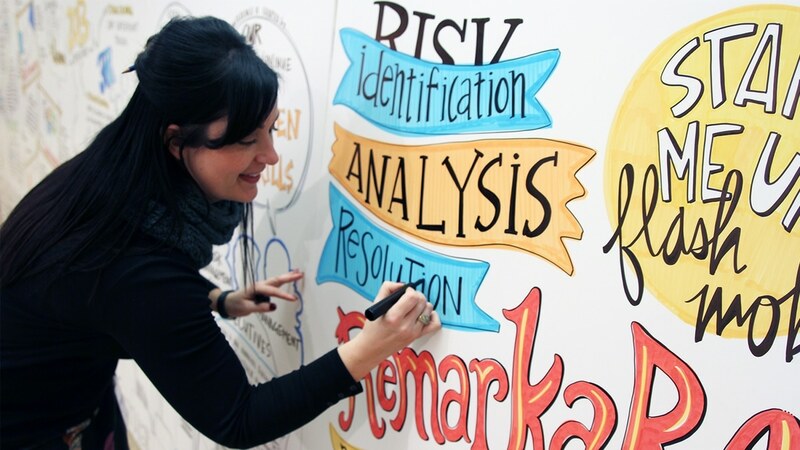 Visual notes can help you tell the story of your small business or organization. Get in touch and we’ll chat about how ours drawings can best do that for you.